I’m Clipping Coupons, Want To Join Me? Did you know you can send MANUFACTURERS coupons to Military overseas and they can use them? The purpose of coupons is to help “stretch your dollar” so imagine what a help it could be to Military families overseas. It is a program called Troupons. I heard, well, read about it on Plucking Of My Heartstrings blog back in May. I have been saving coupons since. We don’t get a lot of MANUFACTURERS coupons, most are store coupons, but I am still saving what I get and I am going to send them off. And, get this . . . they can be expired! Crazy, huh? Well, I really feel that people in the military AND THEIR FAMILIES sacrifice a lot if sending them coupons can help then I will do it. 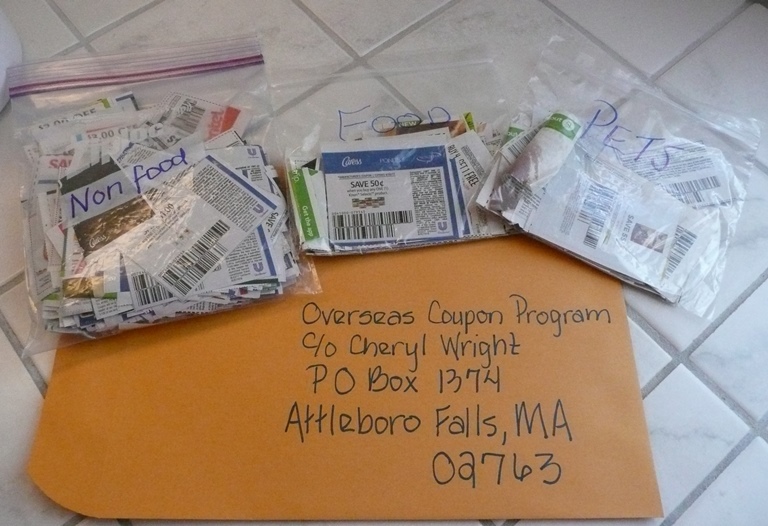 In May Cheryl of the aforementioned blog said a package containing over $5,000 worth of coupons was sent off to a military base in Japan. 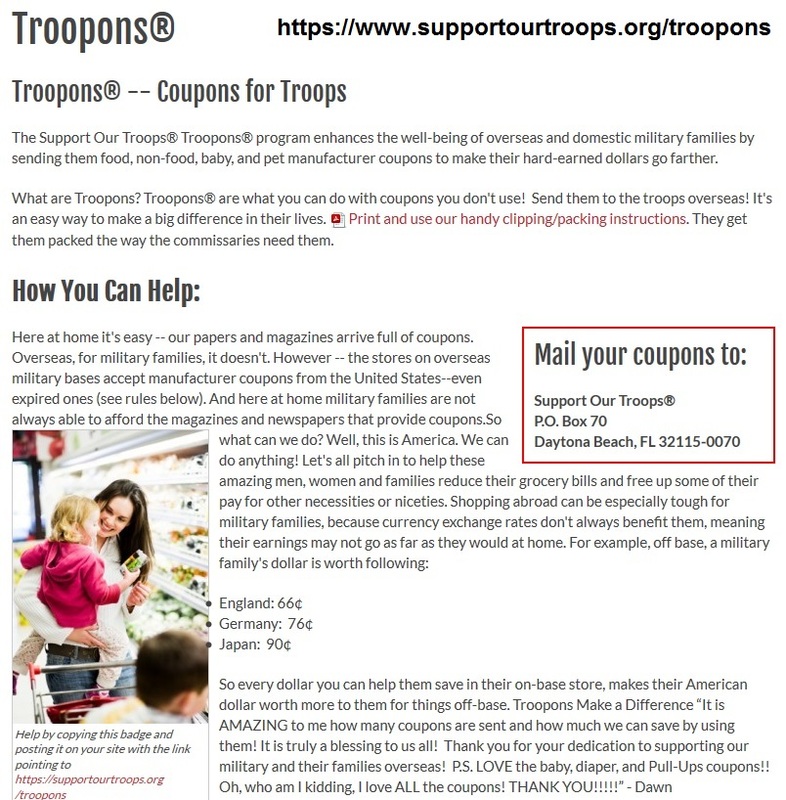 The Troupon page of the Support Our Troops website has all the information you need in case you are interested in sending them coupons. Mail the coupons to Florida and then they send them off to the troops. As I said they have to be manufacturers, not store coupons. When you send them they need to be sorted in separate baggies. A baggie for non-food, a baggie for baby, and a baggie for pets. I was going to wait until I had a few baggies full, but I don’t get that many coupons and that just might take too long. Everything might be past the two-month-past-expiration-date window. Even though the military can use the coupons up to six months after expiration, the program recommends not sending ones that are two months past because it takes a while for the coupons to get where they need to go. So, I am going to send my coupons to Cheryl and let her add my coupons to all the other ones she receives. There was a time when I received stacks of coupons, now the coupons I receive are primarily from stores and those don’t apply. Well, I thought I would just share this because I thought it was a cool program. I am grateful I ran across Plucking Of My Heartstrings and saw it there. I am also grateful that she adopted a base and is helping collect coupons. As I said, I don’t get many, so it will be better if they are added to others. What do you think? Do you think it is a cool program? Do you get manufacturers coupons?